We tend to do a lot of entertaining during the holidays and we want it to be perfect. So it can get a little stressful some times, especially when we invite people over who have different diets and food preferences. Here are a few tips that will reduce your stress and help you pull off that perfect dinner! Before you even think about a menu, ask all of your guests if they have any food allergies, dietary restrictions or strong preferences. The most common issues are people allergic to dairy, wheat and nuts. You should also inquire to see if any of your guests are vegan or vegetarian. It can be very embarrassing to have guests show up and not be able to enjoy the wonderful meal that you have prepared. When planning the meal, especially the main course or the desserts, stick with dishes you know or at least have successfully made once before. Christmas dinner is no time to make something tricky for the first time. Experimenting with a side dish or appetizer is no big deal but don't try to cook the majority of the meal out of a brand new cookbook. Make as many dishes as possible ahead of time. Some things can even be made the day before. If the entire dish cannot be made in advance, at least have all the veggies chopped or the sauce prepared. Doing everything in the hours before the party can make you too exhausted to enjoy yourself and you want to do as little as possible after people arrive so you can mingle with your guests. If guests offer to bring a dish (especially those with dietary restrictions), say YES! Preparing a multi course meal is difficult (and expensive) so if someone offers to bring a salad or a dessert, take them up on it. Just give them some guidance as to the dietary restrictions of the other guests. Even having someone pick up a bag of ice could save you a last minute trip to the store. And when the dinner is over, if your guests graciously want to carry the dishes over to the sink or even put them in the dishwasher, let them help. I know I've mentioned this before but this is the most important thing I do when preparing a big dinner. Write down the menu on a piece of paper. Even if you have all the dishes prepared and and just need to heat them or take them out of the refrigerator, there is a fair chance that you could forget something. There is a lot going on after the guests arrive - not to mention you may have enjoyed a glass or two of wine. By having the menu written down, there will be less of a chance of finding the green beans still on the stove the next morning or those special olives you bought still in the container in the refrigerator. I hope these tips help you enjoy your holiday dinner a little bit more! My son and his wife requested that we have a Spanish theme for this year's Christmas dinner. So this week I dusted off my 18" paella pan and did some experimenting. Paella is very colorful and festive looking, especially when it's full of red and green vegetables! It's perfect for all guests as it is vegan and gluten free. This is my version of Paella. Being from an Italian family, the most difficult thing for me is to let the rice cook without stirring it as I would be constantly doing were I making risotto. I use arborio rice here although the proper paella rice is called "bomba". Arborio is more readily available and works just fine. The proper pan to use is, of course, a paella pan. It's important that you have a big enough stove top to heat the large paella pan evenly. It took part of 3 burners to heat my large 18" pan. Traditionally the vegetables are cooked in oil in the paella pan and then removed until later. I roast the vegetables in the oven instead as it uses a bit less oil and I prefer the flavor and texture of the roasted vegetables. Place peppers, asparagus and mushrooms in a large roasting pan. Sprinkle with oil, salt and pepper and mix until well coated. Roast for 7 minutes. Stir and roast until lightly brown, another 6 to 7 minutes. Heat broth in a small saucepan and keep warm. Crumble the saffron threads while adding them into the broth. Salt and pepper to taste. If you are using bouillon cubes for your broth, they may already contain adequate salt. Heat 1 tablespoon of oil in the paella pan. Add onion and cook until soft, about 5 minutes. Add the tomatoes and cook, stirring frequently, until they are dry.This combination of onion, garlic and tomatoes is called the sofrito. This is called the "sofrito"
Add the rice to the sofrito. Stir well until combined. Cook on medium high heat, stirring continually, until the rice is translucent, 1 to 2 minutes. Add the white wine to the rice and cook, stirring continually, until it is absorbed. Add rice and then wine. Add hot broth to the rice and stir in the peas. Bring the stock to a boil. Do not stir the rice again after the broth is boiling. Arrange thawed artichoke hearts and roasted peppers, asparagus and mushrooms over the rice. Cook uncovered on medium high heat. Move the pan over several burners and rotate occasionally to make sure it is cooking the rice evenly. Cook until the rice begins to appear above the liquid, about 8 to 12 minutes. Reduce the heat to medium low and cover with foil until the rice is cooked, another 8 minutes. If the rice is dry and still a bit hard, add another 1/2 cup of broth or water and cook until done, another 5 minutes. Remove from the heat with the cover on and let rest for 5 minutes. Serve immediately. Per serving (6): 390 calories, 5 g fat, 0.8 g saturated fat, 84 mg omega-3 and 674 mg omega-6 fatty acids, 0 mg cholesterol, 9 g protein, 70 g carbohydrates, 7 g dietary fiber and 275 mg sodium (plus whatever additional salt is added to taste). Per serving (8): 293 calories, 4 g fat, 0.6 g saturated fat, 63 mg omega-3 and 506 mg omega-6 fatty acids, 0 mg cholesterol, 7 g protein, 52 g carbohydrates, 5 g dietary fiber and 206 mg sodium (plus whatever additional salt is added to taste). Vegan Chia Seed Kheer - Dairy And Gluten Free! Vegan Kheer made with chia seeds. Each serving provides over 1 g of omega-3 and 4 g of fiber! My absolute favorite way to finish an Indian meal is to eat kheer, a rice pudding flavored with cardamom, saffron and garnished with nuts and raisins. But kheer is made with dairy, which I can no longer tolerate. White rice is also featured in traditional kheer, which doesn't add much nutritional value. I wanted to create a healthy version of this wonderful dish that I can enjoy and feel good about eating. I think I did it! This recipe uses chia seeds and cashew milk to create the creamy pudding. Chia seeds are packed with omega-3 fatty acids and are a good source of fiber and calcium. Dates and a little stevia are used to naturally sweeten this dessert without using processed sugar. Feel free to adjust the amount of cardamom and saffron to suit your taste . Serve with Vegan Saag Aloo or any of your favorite Indian food recipes. Soak the cashews in water for 6 hours or overnight. In a separate bowl, soak the dates in 2 1/4 cups of water with a pinch of saffron for 6 hours or overnight. Drain the cashews and rinse. Place them in a high speed blender such as a Vitamix or Blendtec. Place the dates and all of their soak water with saffron threads in the blender. Add vanilla, cardamom and stevia and process until it forms a smooth cashew milk. Taste the cashew milk and add additional cardamom or stevia if desired. 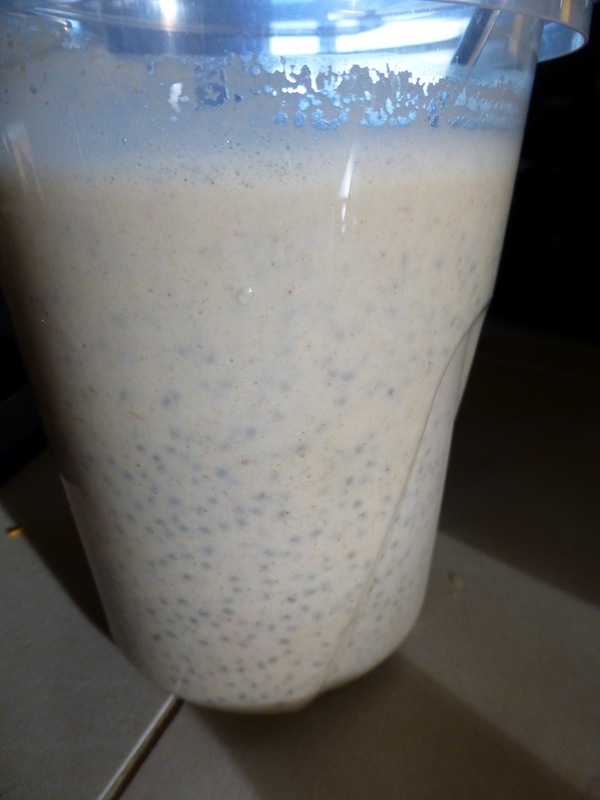 Pour the cashew milk in a 1-quart container and stir in the chia seeds. Stir vigorously with a fork for 1 minute. Let the mixture sit for another 15 minutes and stir again until the chia seeds are well blended and separated. Refrigerate for 24 hours to allow the chia seeds to absorb the cashew milk and the pudding to thicken. To serve, place pudding in small bowls and top with pistachios, almonds and raisins. Top with nuts and raisins and serve! Per serving: 155 calories, 8 g total fat, 1 g saturated fat, 1.1 g omega-3 and 1.7 g omega-6 fatty acids, 4 g protein, 19 g carbohydrates, 4 g dietary fiber and 3 mg of sodium. Persimmon, orange & pear smoothie - deliciously high in fiber! I really love persimmons - all kinds. The Fuyu persimmons that are meant to be eaten like an apple - crisp and firm and the Hachiya persimmons that must be very soft and ripe before eating. Both are high in vitamins A and C as well as manganese. The hachiya persimmon is tall and long (on left). Eat when soft. The fuyu is short and squatty (on right). Eat when firm & crisp. Fruit not only plays a critical role in providing vitamin C, but also in providing dietary fiber. 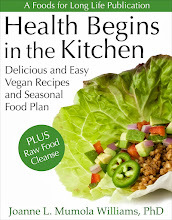 In colder months our consumption of raw foods naturally decreases and with it, many times, our intake of fiber. So eating high fiber fruits, such as persimmons and pears, becomes very important. Here are two simple recipes that incorporate pears, persimmons and oranges. both recipes are suitable for a raw food cleanse. 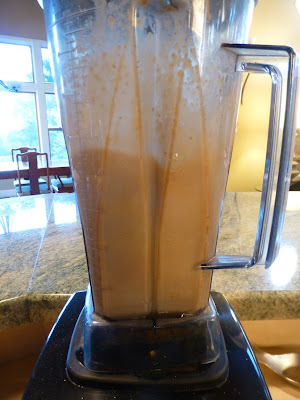 Place all ingredients, except the flaxseed oil, in a blender and process until smooth. Add the flaxseed oil and process briefly until combined. * For a raw smoothie, use home-made almond milk. Per serving: 247 calories, 6.7 g total fat, 0.5 g saturated fat, 0 g cholesterol, 2.4 g omega-3 and 0.7 g omega-6 fatty acids**, 2.3 g protein, 50 g carbohydrates, 10.5 g dietary fiber and 93 mg of sodium. ** The amount of fatty acids does not include any contribution from the almond milk since that information is not provided from the manufacturer. Place all ingredients in a bowl and gently toss. Serve immediately. Per small side serving (4): 126 calories, 5 g total fat, 0.5 g saturated fat, 668 mg omega-3 and 2.8 g omega-6 fatty acids, 2 g protein, 22 g carbohydrate, 4.6 g dietary fiber and 1 mg sodium. Per large serving (2): 252 calories, 10 g total fat, 1 g saturated fat, 1.3 g omega-3 and 5.6 g omega-6 fatty acids, 4 g protein, 43 g carbohydrates, 9 g dietary fiber and 2 mg sodium.